Have you heard from your friends how much they love their nursing pillows? Do you want to try one to see what all the fuss is about? Nursing pillows are immensely popular with moms because they offer comfort and convenience. But figuring out which one to choose is difficult, especially with so many moms who are passionate about their favorites. We’ll look at two popular pillows — Boppy Nursing Pillow and My Brest Friend. What is My Brest Friend? The Boppy look like travel neck pillows – like a C-shaped doughnut that someone has taken a bite out of. These pillows have so many uses. You can use them to prop up your baby while you are breastfeeding or bottle feeding. The pillows are sold plain like a bed pillow would be. You then buy a slipcover for it so you can use whatever color scheme fits in with your house. Because you can change and wash these slipcovers, it helps keep pillows from having that sour milk smell if your baby spits up on them. Boppy pillows aren’t big enough to go all the way around you, so you’ll need a separate pillow if you want to support your back. Boppy pillows have uses other than just helping you feed your baby. You can use Boppy pillows to sit on when you’re still sore for the first two or three weeks after delivery. It’s especially soothing for moms who had stitches as a result of delivery. You can use them to help an older sibling find a safe position on the floor to hold their baby brother or sister. Or use the Boppy pillow to support your baby while he learns the sitting position. Boppy pillows can be used to help prop up babies during their dreaded tummy time (source). My children hated tummy time with a passion, but doctors say it’s good for babies so we would go through our daily ritual of supervised tummy time. Boppy pillows can make it more enjoyable for infants so having one around is worth the money just for that reason to me. My Brest Friend is a nursing pillow that in many ways is like a Boppy. They both help with the sometimes awkward process of breastfeeding. But, unlike the Boppy, the top side of My Brest Friend is flat, which means your baby stays where you put her, and there’s no rolling baby syndrome while you feed her. My Brest Friend also has two added features that I love – there’s a snap that secures the pillow in place, and the pillow goes all the way around the mother, giving her much-needed back support. The debate between these two types of pillows has raged on in recent years. They are both so popular and offer great support for moms, whether they are breastfeeding or bottle feeding. They each have their selling points, and sometimes moms find they want both pillows to cover everything they are looking for. My Brest Friend’s primary purpose is as a nursing pillow, while the Boppy pillow is a multi-stage pillow that can also be used for nursing. 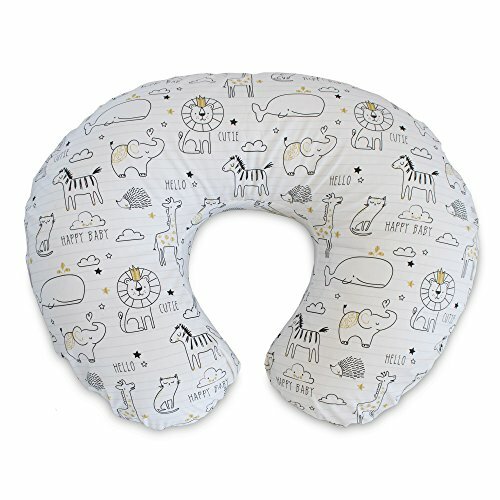 Boppy pillows aren’t always the best choice for nursing newborns because of their rounded nature and the fact there aren’t any straps to hold it in place. Plus, when a baby is a newborn, that’s when moms can most use the added back support that My Brest Friend offers. Childbirth can be extremely hard on your back, and you can get backaches for weeks afterward (source). I did, and they were brutal. I would be trying to feed my baby, and my back would be on fire no matter what position I tried. The only thing that helped was a pillow jammed behind my back, supporting just the right spot. The pain, coupled with the feeling of failure for not being able to feed your baby without agony, isn’t a good combo when your body is still flooded with pregnancy hormones. It’s enough to send you spiraling into the biggest pity party in the world. If a pillow can stop those feelings of self-doubt from creeping in, it’s worth every penny. My Brest Friend is a nursing pillow that moms use to make nursing their babies easier. The pillow wraps around the mom using it and promises to help babies maintain the correct position they need to fully latch on to their breastfeeding mom. In addition, the back support is supposed to help with posture, and back and neck pain. The front cushion is flat. Not easy to put on one-handed. Let’s look at some of the features and benefits you can expect to find while using My Brest Friend. This pillow is easy to figure out how to use, but unfortunately, it’s not as easy to put on as some busy moms would hope it would be. If you already have your hungry, upset baby in your arms, it can be really tricky to put this pillow on one-handed, even once you get the hang of it. You’ll probably have to put your baby down for a minute while you get the pillow in place. The thing that really makes My Brest Friend stand out from other nursing pillows is the comfort factor. The back support on this pillow is a great addition for moms, especially in the weeks after delivery when your back hurts so much you can barely stand it sometimes. Whoever thought of making the front pillow section flat was a genius. It’s hard sometimes using puffy or rounded nursing pillows because your baby tends to roll in one direction or another, which is a pain once they have a good latch on you. The flat surface keeps them in position better. It’s wonderful this pillow comes with a slipcover because when you’re breastfeeding, you’re eventually going to get some milk or spit-up on it. It’s nice that your whole pillow isn’t ruined — you can just take off the slipcover and wash it. Considering you’ll get a lot of use out of this pillow and that it comes with a slipcover, the price isn’t bad. It’s definitely cheaper than paying a visit to your chiropractor because your back is constantly hurting. What Makes It Better Than the Boppy? It offers back support: The importance of back support can’t be overlooked after you’ve had a baby. Your body has just been through a tremendous strain and you’re adding to it by carrying your baby everywhere with you. It helps to have something have your back — literally. It’s made out of 100 percent cotton: Moms worry a lot about the substances that touch their baby’s skin. Moms who are looking for a natural fabric or product to use for their baby should be happy this one is solely made out of cotton instead of primarily polyester like the Boppy is. It has a strap to hold it in place: As a mom, you can spend a lot of time getting your nursing pillow in just the right position. You feel like you’re in heaven — until it slips and you’re back to square one. With the latching strap this pillow comes with, it stays in place much better than the Boppy does. The Boppy is one of the most popular brands of nursing pillows on the market. This nursing pillow can be useful to moms long after their breastfeeding days are over. It can be used for propping your baby up as it learns to sit, helping them with tummy time, and more. Good for larger women who might not be able to use smaller nursing pillows. Can be used for many stages of baby’s development. A little more expensive than some other nursing pillows. Your baby can sink into the pillow a bit while breastfeeding because it’s softer than some others. Let’s look at some of the features and benefits you should expect to see fromThe Boppy. The Boppy is really easy to use — it doesn’t have any straps or buckles you have to mess with. It just slides around your waist and, even though the pillow is somewhat big and a little bulky, it’s still possible to put it on with one hand. When you use this on the floor to assist your baby as they learn to sit up, it’s also super easy to use — just make sure to supervise them when they’re using it for that purpose. The Boppy is a really comfortable nursing pillow, and the material feels snuggly, which your child should love. The only drawback to it is that the pillow is a little squishy and more rounded, which means as you use it for breastfeeding, your baby may roll a bit toward you since the surface isn’t flat. But as they use it for other purposes, the squishiness factor can come in handy and feel really comfortable. The Boppy comes with a slipcover that’s easy to take on and off. You can wash it in your washing machine so the pillow will stay clean and fresh. If you don’t mind spending the money, you can buy an extra slipcover to use when the other one is in the washing machine. Although it’s not the cheapest nursing pillow on the market, it can be used for others things, such as helping your baby learn to sit up independently. Its versatility helps take the sting out of the slightly higher price. What Makes It Better Than My Brest Friend? It’s easier to put on: Since this pillow doesn’t wrap entirely around you, it’s easier to get into, especially if you only have one hand free to do the work. 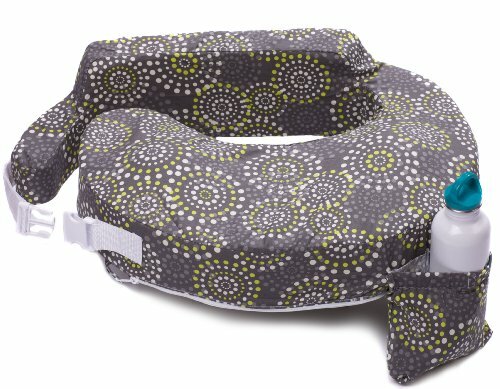 For moms who are trying to soothe their babies while getting the pillow into position, it’s a great choice. It fits larger women: Moms come in all shapes and sizes, but products for moms don’t always cater to all sizes. While this pillow won’t fit everyone, it’s still a good alternative for bigger women who can’t wrestle their way into the belt of the My Brest Friend pillow. It’s multi-purpose: Sometimes after labor, depending upon how things go for you, it can feel really sore to sit down. The Boppy is much more comfortable than My Brest Friend if you need something soft to sit on the first couple weeks after delivery. Plus, your child can use it as they get older for comfy sitting or even later on for napping. Which pillow is right for you ultimately comes down to your own personal situation. No one can decide that for you. Look at your own circumstances — if you’re a larger mother and you’re worried about the pillow fitting you, you might want to opt for The Boppy. If you love the idea of the pillow not shifting or having your baby accidentally roll to you while breastfeeding, maybe My Brest Friend is better for you. They are both great nursing pillows that have provided a lot of comfort to moms across the country.